"An apple a day keeps the doctor away." How many times have you heard that in your life? Enough to realize it's not true, I'm sure. But in the case of the new DKNY Delicious Candy Apples Fragrance Collection, I have a feeling it could actually happen! I was in love with the three fragrances in this collection the second I took them out of their vibrantly patterned boxes. Each is crafted in DKNY's signature apple shape -- but this time, they include a signature stick much in the vein of a real candy apple. The inspiration lies in the pairing of a ripe, juicy apple with the sweetness of candy. Each one is designed to satisfy your sweet tooth! Sweet Caramel contains notes of candy apple, pear, marshmallow, jasmine, muguet, violet, whipped vanilla, creamy caramel and greens. It's sweet without feeling overpowering or cloying -- the combination of notes really makes it feel sensual and sophisticated instead of young and teenybopperish. Ripe Raspberry contains notes of raspberry, apple, lime, peony, lily and cola. I have to admit, this is the one that worried me the most -- because, unlike most people growing up, I hated the raspberry scent from Bath and Body Works. I thought it was the most annoyingly, sickeningly sweet scent on the face of the planet. Luckily, this scent is nothing like that! The scent of raspberry is offput by so many other floral and fruity notes that it becomes a beautifully rich aroma that just envelops you. Juicy Berry contains notes of black currant, blackberry, pear, lychee, nectar, rose petals, apple blossom, sandalwood and blonde woods. This is the freshest, youngest scent of the three -- but it still exudes a sophistication and sexiness not often found in fruity scents. The addition of musky notes really helps to set it apart. The only bad part about these three delicious candy apples? You can't actually eat them. 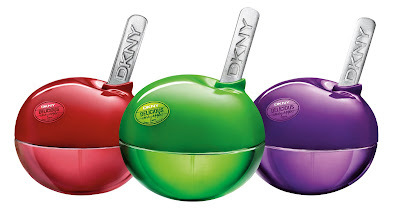 DKNY Delicious Candy Apple Fragrances retail for $55 each. DKNY Delicious Candy Apples Collection is really awesome. The Candy Apples fragrance flavors include: Sweet Caramel, Ripe Raspberry and Juicy Berry these all are so delicious. Thank you for sharing.